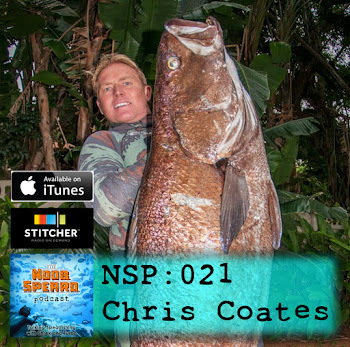 Jaco one SA most prominent spearfisherman and a guy who has proven to be able to hold his own against the rest of the world & he ceases to amaze us. Every year there is another story of Jaco clapping some amazing fish .... and often in extreme circumstances. This day was no exception! A 27kg Couta (weighed gutted) and a 110kg Black Marlin ...on a reel gun!! You are probably wondering where? ...Well ..Where else but the Shoal!! Any of those fish alone would be cause for celebration, but the two together! 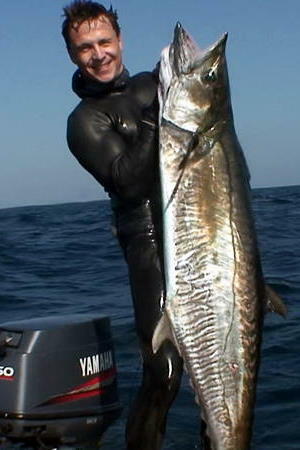 Oh did I mention he also got a 15kg Wahoo and 15kg Kingfish aswell that day. 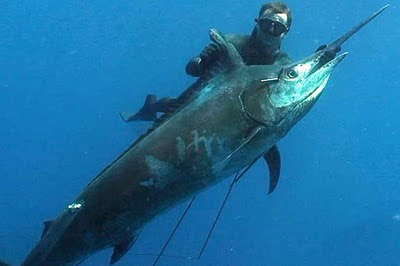 Jaco and his 110kg Black Marlin Shot with a reelgun! 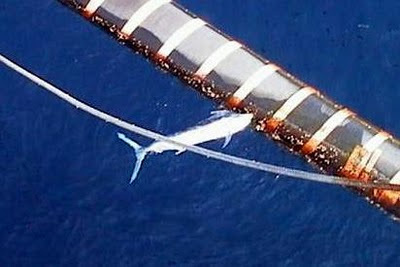 Apparently the Marlin took 2 hours to land as he plugged the thing with a reel gun! It makes you think he must have had a pretty busy morning ?? The whole thing was video taped and if you are like me I am itching to see how the whole thing went down. So while the shoal couta are a no show ...well at least the rest of the sea is still kicking! Sorry for being so quiet, its just that there has been very little to report on or anything of interest. The dive has been very dismal here on the north coast. Besides the fact that the Couta are virtually a no show the conditions have be horrid to say the least. March and the Cray season are living up to their worst expectations and there have been few good days let alone a couple that are good enough to get in and get your buggs. I hear the south coast has been a little more consistent, but no fire works. I will be sure to post if I hear anything going down. Salty Divers Mini Apnea workshop & Free Diving Training with Centurion Freedivers. This past friday night the Salt Rock Spearfishing Club was treated to a mini apnea workshop & training session by Fernando from Centurion Freediviers. We did some basic freediving physics and physiology. Fernando also covered the basic saftey guidlines and practices. The practical started with some relaxation techniques and apnea breathing techniques. These were very in lightning and it will be good to go and implement these out in the sea. Fernando instructing the Co2 and O2 tables practical session in the pool. After we were warmed up and relaxed we headed to the pool to put into practice some apnea excersizes. We did static apneas using Co2 and O2 Tables, this was a real eye opener for most who very easily under Fernando's instruction broke there personal bests and reached each the taget times with ease. After the pool session the guys and their wives enjoyed some drinks complements of SAB and a braai around the pool. A big thanks to Fernando for putting the training session and course material together and Princes grant for the use of their pool. 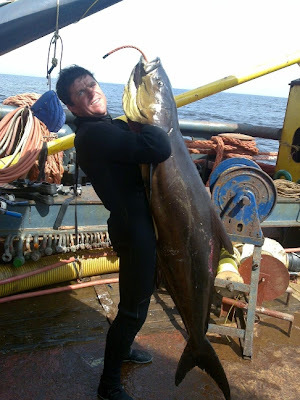 Here is another story from Angola, this time its about spearfishing and a massive 50kg Cobia / Prodigal Son. I know a couple guys who are commercial divers up that side of the west coast of Africa. 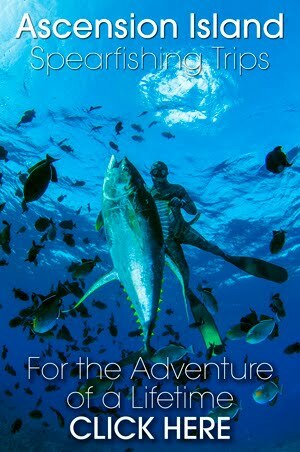 They all tell amazing stories of how good the spearfishing is .. especially off Angola. 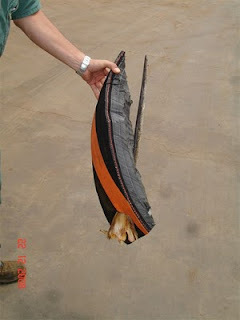 My fish was shot at about 11m down in around 32m of water here in Northern Angola. My first dive for the day. I still chinged Gerhard Vosloo to see who was going to tie the down line onto the SBM. He lost so i got first dive down the anchor chains. I levelled off at around 11m. There were loads of Kingy's swimming about but i was waiting for a decent snapper to make an appearance. As we normally do, just before i was about to come up, i turned around and saw this dark shape sliding in! It came up level with me and within a good range. And i just picked my spot and let it fly. Hit it a couple of cm above the pec fin and rolled it over! I was pretty stoked and swimming the fish up i was still thinking this is pretty heavy! Only once it was on deck did i realise just how big, and obviously once it was on the scale, Totally Stoked! A bit of a bitter pill for Gerhard. He'd seen it 4 days previously at another buoy about 10 miles away.That was after the working diver in the water did a back flip cause this "shark" was swimming up to him! He got kitted up quickly, got impatient, pulled of a long shot and just managed to graze it. He still said as we were kitting up. I bet you we'l see that prodigal today. Then he lost the ching and he said when he heard the gun go off he just new. True enough the graze was on the fishes back, but its mine! Ha ha! Hope the pictures make it through. This is the first Internet connection we've had in 4 weeks. And its iffy. LONDON, Feb 2 2010(Reuters) - Swordfish punctured part an oil loading pipe in Angola, causing a three-day halt to tanker shipments of Girassol crude, traders said on Tuesday. French oil company Total (TOTF.PA: Quote, Profile, Research), which operates the crude stream declared force majeure on shipments, a suspension of supply obligations due to extraordinary circumstances, but lifted it on Monday. "It was caused because of swordfish. Now the swordfish have passed so the force majeure has been lifted," said one trader, who buys the crude on regular basis. Slight delays to cargo loadings scheduled in February and March were likely, traders said. Girassol crude is produced from an offshore oilfield, with an average loading rate of about 250,000 barrels per day. This marlin was probably chasing some Dorado or other fish attracted to the floating oil pipeline, when it hit the thick rubber. This marlin bill looks like it could be from a fish of at least 200kg, it looks longer and thinner than a Black Marlin and probably was a Blue Marlin. It must have had some serious pace to have gone through that rubber! Here is another one..with some sharks! ... Click Here ..
Hope for Angling and Spearfishing Fees Fiasco. * Marine and Coastal Management spokesperson Zolile Nqayi says the published date of implementation of the increased recreational angling fees (1 May) may be delayed. Nqayi also said the new fees may possibly 'only be related to the consumer price index' rather than the increases published in the Government Gazette. Sorry for not posting last week, I had my head in a hole getting the magazine done for print this week. I took yesterday off as the conditions were good and the mag was in proofing, and I got lucky with a nice fat Couta. So where are the Couta? This has to be the worst summer season ever?? I know guys who have pushed 8 dives in a row with out getting one. Sure the snoek are still around and you can pick up one or two in the shallows. But its the Couta we should be getting! The seasons did seem late this year and hopefully we will see some more Couta coming out, but the norm is that towards the end of march the Couta start thinning out only leaving the odd big fella. The Cray fish season open yesterday and for once the conditions were very good on the first day. I decided to go visit a deep section of reef further north away from the crowds, I had spoken to a very good paddle ski fisherman who had said that he had been getting a few Couta ... but all in the deep. I got to the ref as it was getting light, my first dive down 2 Couta came in on the flashers and I got a good shot into the one fish. Somehow it came off and while i was reloading my mate rat got a nice Iggie. My next dive into the morning gloom saw me almost miss the fish. I was about to turn to go back up and saw a tail. I chased the fish and closed the gap ... a little while later one fat boy fish was one the ski. After that everything went quiet, I really thought that it was going to turn on! We went into the shallows and got some snoek before heading home. As it turns out not many fish came out allong the North Coast yesterday. It really is strange as everything was perfect for fish .... they just wernt there. As per usual the weatehr has gone pear shaped ... it must be Bugg season. It looks like Monday will be our first good day this next week.